Our Kits really are simple to install! 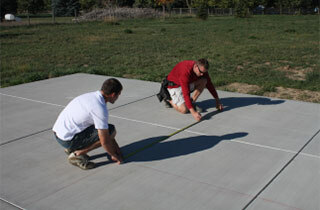 Because our patio kits are all pre-cut to the size you need, installation is a breeze! All you need are a few basic tools and an extra hand for some of the installation. Included with each kit, you receive written instructions to help you install your kit just like a pro! Or, view step by step PHOTO instructions! If you’re experiencing a problem or need some questions answered, we’re here to help. Call our toll free number Monday-Friday 8am-5pm (mst) and one of our installation experts will gladly walk you through any problem you’re experiencing or answer any questions you may have. Prefer To Have Your Kit Installed Professionally? If you would rather have your kit installed by a professional, call us to see if we know an independent installer in your city. If there are none, we will assist you in finding a deck builder or handyman and we?ll work with them to make sure they know how to install our patio covers professionally. Easy to install! View step by step PHOTO instructions!